Join us Friday, July 31 from 11am-1pm to receive 15% off your entire purchase during the "Classics Hits" radio remote. No additional coupons or discounts apply. 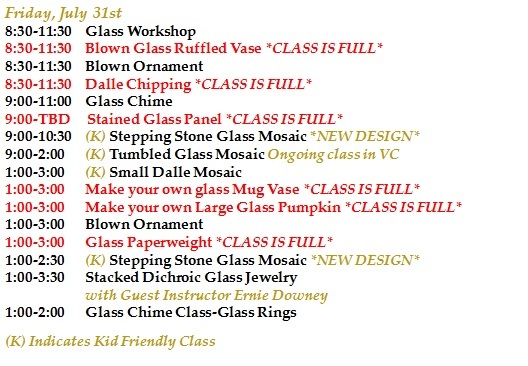 Also be sure to sign up for glass giveaways each day during the festival. 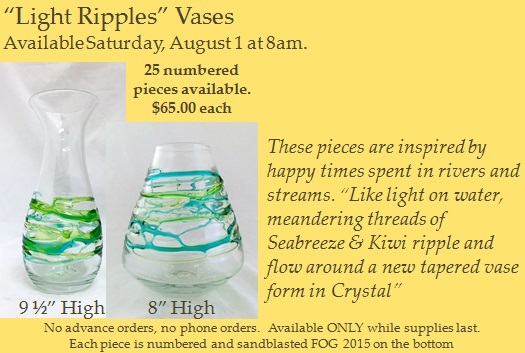 Our 8th Annual Festival of Glass event will be held at the Blenko Glass factory on Friday, July 31 and Saturday, August 1. FREE parking will be available, everyone who attends will receive a FREE collectable medallion (while supplies last), visitors will have the opportunity to view our skilled artisans at work as well as be able to participate in a variety of classes related to the glass making process (fees apply). 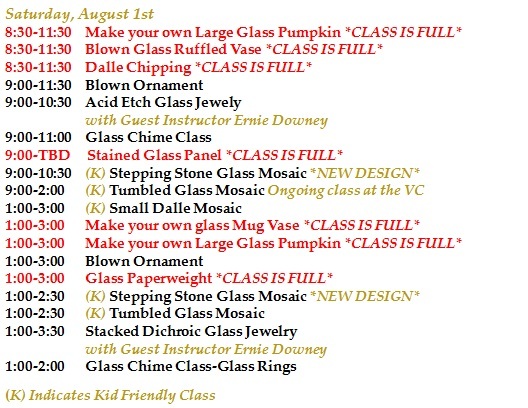 Descriptions of our newly designed Limited Edition products as well as a class schedule with remaining openings can be seen below. Call us at (877) 425-3656 with questions and to sign up. To reserve your spot, payment must be secured by Visa, MasterCard, Discover or American Express at the time of reservation. Cash or Check payments must be received no later than Friday, July 24. Classes must be paid in full before the Festival. Any unpaid reservation will be cancelled and reopened to other customers. Credit card payments will be processed at time of reservation. For cash/check payments you may stop by the Main Office Mon-Fri 8am-2:30pm or mail check payments to Blenko Glass Co., P.O. Box 67, Milton, WV 25541. If you have any questions regarding payment, please contact Tammy McDonald at (877) 425-3656. Thank You. This coupon can be redeemed for $5 off a purchase of $25 or more at our Visitor Center Store. Limit one coupon per customer per purchase. Coupons cannot be combined with any other offers. Discounts not valid on Limited Edition Items or hand-painted items.